On medium heat, melt butter in a large pot. Once melted, add the marshmallows and stir continuously until melted. Remove from heat. Add 5 or 6 drops of food coloring to ensure the color is vibrant and not pale. Stir in the rice puffs and ensure they are completely coated. Once coated, spray hands with cooking spray so that the marshmallow treats don’t stick to your hands. 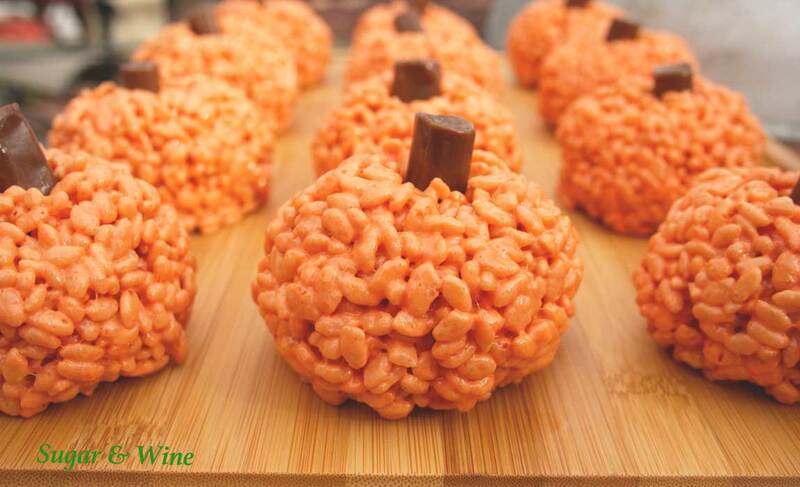 Shape a scoop of the treats into a ball and insert a tootsie roll into the top of the pumpkin. Set aside and let them cool (and gel) before eating. This is a pretty simple treat to make but the biggest tips I would give is to re-apply the cooking spray on your hands frequently and move quickly so that you can shape the balls.